The United People’s Freedom Alliance (UPFA) today briefed the Election Commissioner regarding the various problems allegedly faced by the party, such as the lack of security ex-MPs and the summoning of candidates before the FCID, ahead of the General Election. A problem has arisen regarding the security of the UPFA’s leaders as security provided to UPFA candidates including former Ministers have been removed, the party’s General Secretary Susil Premajayantha said. Giving an example to the dangers faced by UPFA candidates, he claimed that a certain UNP supporter had threatened former Minister Dullas Alahapperuma after the latter had submitted nominations to the Matara District Secretariat last Monday. Premajayantha said that they requested the Elections Commissioner to conduct a proper investigation into the matter. On the other hand the Police Financial Crimes Investigation Division (FCID) is summoning UPFA candidates for questioning and the immense publicity given to this is affecting the party’s election campaign, he told reporters outside the Elections Secretariat in Colombo. The former Minister stated that some are just accusations and that they have no issue if party members are summoned and investigated after the election. 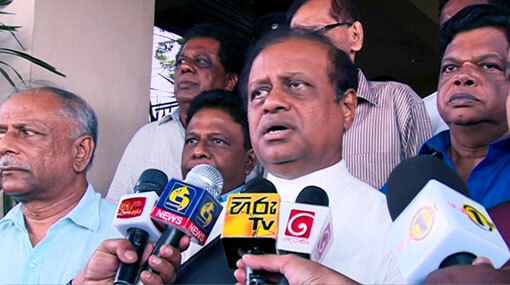 Premajayantha also accused the United National Party (UNP) of abusing state property for election related activities. He claimed that 52 vehicles belonging to the Ministry of Youth Affairs and Skills Development have been used for election campaigning. The UPFA General Secretary said that they expect the Elections Commissioner Mahinda Deshapriya to take proper action regarding these issues.